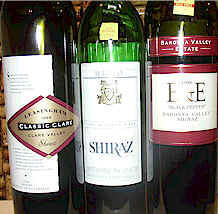 In our search for outstanding wines, we've tasted a number of rather interesting Shiraz wines from Australia. These are made, of course, from the variety known elsewhere as "Syrah." 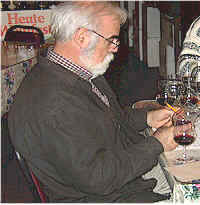 Most Australian producers seemed to strive to make big, oaky reds from their Syrah or Shiraz vines. One prominent French Rhne winemaker told me a few years ago "We feel more kinship with our California 'cousins' than with the Australians." This is, I suspect, because the Aussie Shiraz wines he'd tasted were more like huge Cabernets or Zinfandels than the spicy, more structured wines he was accustomed to. 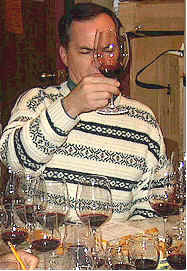 Described by one taster as displaying "pickle barrel aromas with so much American oak that the fruit can sustain it." Another fellow said it as more like a "Central Valley, California Pinot Noir." 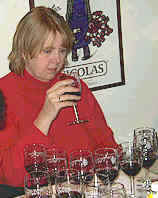 Other tasters found barnyard aromas which were not attractive. One person found "anise and fennel notes on the palate" and felt this wine might age well. I found the color of this wine to be weak, showing more the character of an odd Pinot Noir than solidly-made Shiraz. The aromas are vegetal, weedy and show a streak of cassis-like fruit. There are gamey, weedy flavors on the palate. What makes this worth $60 to someone is a curiosity! This winery has been making some impressive wines of late, but this offering didn't impress but one tasting participant. One critic downgraded it for a "short and weak finish." Another person felt it "smells like a sewer...too many off notes here." There was some question as to whether or not this was a corked bottle, but the most sensitive sniffers amongst us didn't think it was "corked." Still, it was not "right." One person did feel this was somewhat "Rhne like." Many found it to be "too tannic." One fellow said "Under the tannins, it's rather pleasant...but the nose is poor." Someone else found it to show "dark berry fruit and it needs a long time in the cellar." I found some red berry fruit notes on the nose with a faint touch of wood. I kept wavering about the faintly evident 'cellar smells' here. It's nicely acidic and has some berry fruit notes on the palate. While the structure suggests 5-10 years of aging, I'd sure like to taste another bottle before stashing this. This is the "entry level" bottling for the Wolf Blass brand and I threw it in the tasting because I've found it to be pretty good for its small price tag. A number of tasters downgraded it for its simplicity. "It's got a simple, strawberry nose." said one critic. Another described it as having "cinnamon stock aromas and some sugar candy on the palate...very simple and easy." One woman swore it's "just like fresh mulberries." Another fellow described it as "Rhubarb jelly sort of flavors and it really sang on the finish being very pretty wine." Some felt it was reminiscent of California Zinfandel while another taster likened it to "pomegranate juice being a bit shrill and having some cooked cherry fruit." I found the nose reminiscent of flowers, finding a sweet rose sort of fragrance here. The wine combines an element of the fruity freshness of Beaujolais with Aussie Shiraz. It's youthful and charming on the palate with lots of raspberry and blackberry fruit notes. I'd give it a one-and-a-half star rating on my three star scale, noting that "no stars" equates to an average quality wine. For those who view cellaring potential as a key component in "fine wine," you won't find much of it here. Here is a wine of controversy, garnering three first place votes, no seconds and two "rejection notices." One critic described the aromas as being reminiscent of "road tar." Another found a "bad asparagus character" which didn't appeal. Someone described the aromas as reminiscent of a "peppermint patty candy, being kind of treacley and off-putting." Another taster concurred, saying it was like a "chocolate mint." A technically-minded taster felt this has "lots of skin contact during its fermentation and it's really bitter." One participant said it's "thin, flat and one-dimensional." Another found it to display "ginger, mint and menthol and a confectionary character." "It had more fruit of any of the oak monsters." said another taster, while someone else found it "very delightful." I was enchanted by the intensity of the fruit on the nose. It's almost unmistakable as an Aussie Shiraz, having that candied violet fragrance I have found in many of these wines over the years. The same character shines brightly on the palate. Lots of berries, lots of violets and a touch of oak. Two to two-and-a-half stars. "This has spicy, black licorice notes and it's a bit metallic with some chocolate and raspberry flavors making it almost Port-like." said one critic. Another person found it "very sweet on the nose." One critic marked it down for being "too sharp and too spicy." One panel member felt it had "changed radically over the course of the tasting," saying it "seems fuller now than it did when we first poured it. 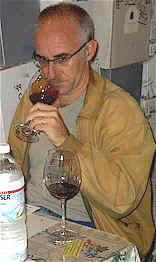 The wine shows a nice black cherry nose." Someone criticized it for being "superficial and not having much stuffing." Another taster found it "hot and showing black pepper notes." I found the nose to show some mildly toasty oak with some nice cedary undertones. It's nicely complex on the nose. The wine is fruity, berryish and is a classy, lovely red wine. One-and-a-half stars. "Mint and eucalyptus dominate the character of this wine." said one panel member. Another found "Sweet cream and vanilla with cherry and chocolate notes. It's really lovely!" Someone else found "good fruit and good balance." A couple of tasters felt this would age well, while one person disagreed saying it's low in acidity and high in alcohol." I found the initial fragrances to be quite nice, showing some woodsy notes and violets and berries. The oak seemed a bit strong at first, reminding me a bit of Bourbon. The flavors are nice, though and its a pleasant enough red worthy of a one-star rating. It's especially good given its reasonable price. "Lots of trees died to make this puppy." said one taster. Another person found "black currants, dried herbs and flowers with a hint of black licorice and dried cranberries." Someone else found "pepper on the palate with a long finish." One taster found this to be "the most complex wine with dark berry fruit and some sweet, tarry notes, though the tannin is too predominant." I found both red and black fruit aromas with a modest amount of wood on the nose. The same features hit the palate and there's a nice vanillin fish to this woodsy red wine. One star+. 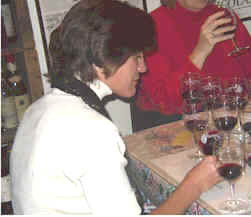 The run-away winner of the tasting, one woman found it "cloudy on the appearance, with a closed-in, vanillin nose having some cream, ripe, sweet, plummy chocolate notes." Somebody else found "cinnamon and clove notes and some burnt cherry fruit. And it has the nicest balance and a great finish." Another taster felt this is "short on fruit, long on oak." One person said this has "mega-extract." I found this to not have a shortage of oak, displaying cedary, oaky notes that cover some of the fruit. Still, it's a pleasantly woodsy red wine with good vanillin. I'd peg this as a Cabernet-styled red given its oak. Perfect for a grilled steak. One-and-a-half to two stars.